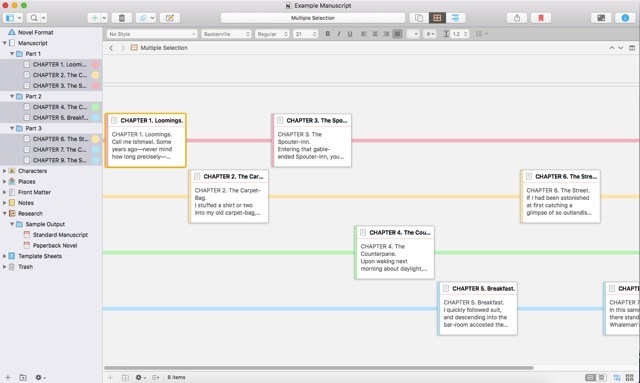 The Scrivener Timeline feature is so intuitive, it’s hard to believe that it wasn’t one of the first things developed, back in version 1.0. But it was worth the wait. Here’s how it works. It’s important to note that you won’t see any sign of those labels in the binder (that column of items on the left) unless you go to VIEW > USE LABEL COLOR IN > BINDER. Then it’ll look like this (see image on the left there). And this is kind of neat and all, but where it really gets useful is when you click to go to corkboard view. To do that, you can either click the little icon at the top (just right of the header bar) that looks like a waffle. OR you can cherry pick the items you want to work with (COMMAND-click on my mac), then click the icon at the bottom right of your screen to display those items in the corkboard. Looking at it like that I can see that my story starts out with more of Sam’s POV, then kind of shifts to more of Alex’s POV. Maybe I intended that, maybe not. You can change the size and spacing of the cards which really helps a writer see all their cards in whatever space they happen to have. I like my little laptop screen, but I know some writers work on big ‘ol screens, and this feature works for both. If you move a card around (say from one timeline to another, or to a spot earlier or later in the story) it will move accordingly in your binder. Even the color will change automatically. 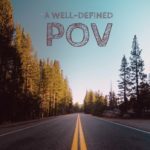 If you’ve ever attended a writing conference or picked up a Writer’s Digest, you’ve heard how adverbs are the enemy of good writing. They weaken our verbs, and by association, our prose. 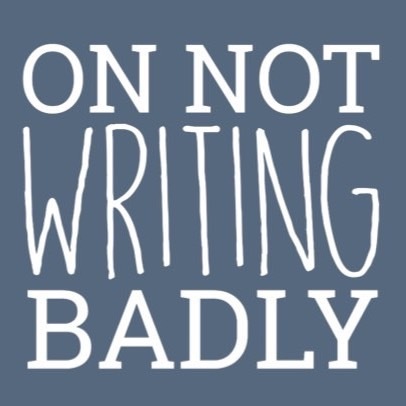 But sometimes it can be hard to see our own writing objectively. Our eyes can skim right over things without seeing them. 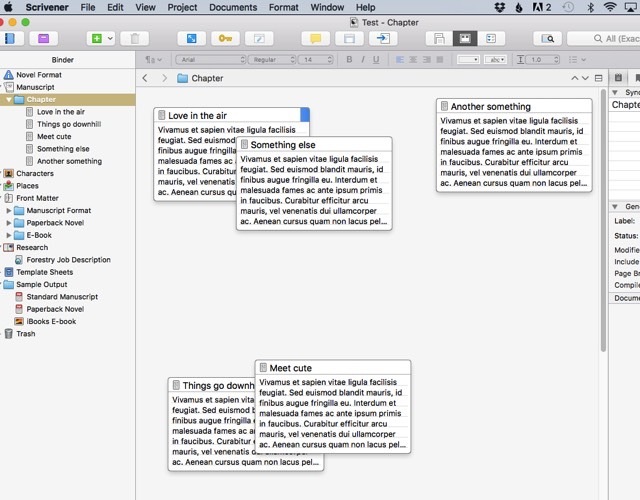 So I’m loving this new feature in Scrivener 3.0. It’s called the Linguistic Focus. 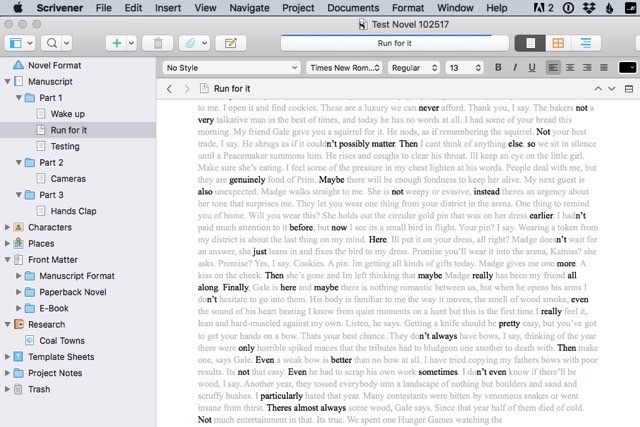 Select the text file in the binder that you want to focus on, go to edit -> writing tools -> linguistic focus. As a fun side note, you don’t have to select adverbs. You can choose direct speech, nouns, verbs, prepositions and more. 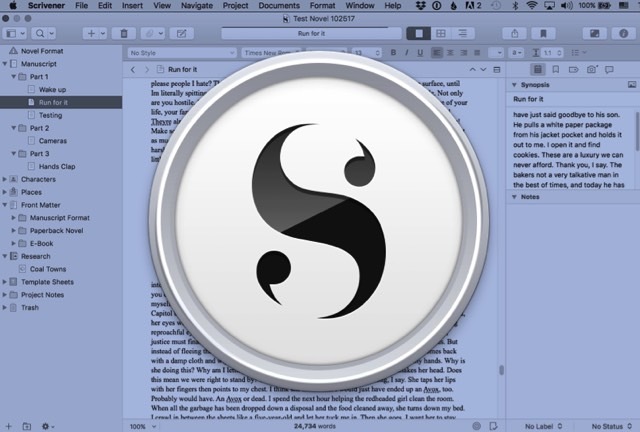 It’s one of the many new functions that the folks at Scrivener added when they did their recent software update. 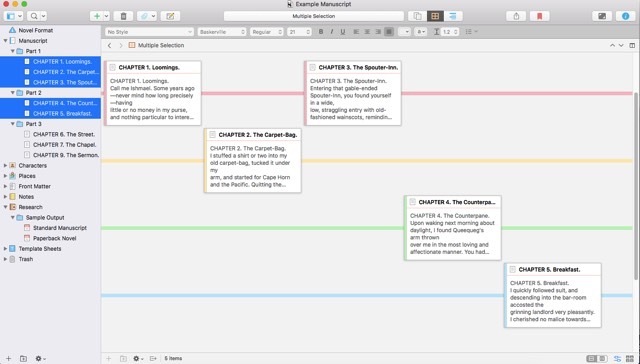 Stay tuned for more posts on all things Scrivener. 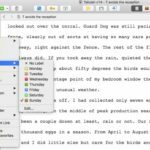 If you use Scrivener, you are probably aware that the company recently released an update for the software: Scrivener 3.0. If you’re like me, you’re probably feeling a little nervous about it. I like to think of myself as pretty tech savvy, but updates always make me cringe. Because even if they’re great (and let’s face it, software upgrades can be full of glitches) updating can mean wrapping my brain around new ways of doing things. So even though I’m a total Scrivener nerd, I dragged my feet a bit on downloading the update. But last week I decided to go for it and let me just tell you now, officially, for the record: it’s good. You can update now and go right back to writing. Seriously, it didn’t require any extra brain power to get up and running with it. There is only one tiny thing I would say you need to know to avoid frustration as you make the transition and that is the new location of the search bar. The search bar used to be at the top right. In the update they’ve moved it to the header, but it’s kind of hidden. See the header bar at the top, and how it tells you want section you’re looking at. In this case, it’s my whole manuscript. As I mentioned, I’ll be blogging about some of the cool new features in Scrivener 3.0, so make sure to check back, or sign up for my newsletter and get posts delivered directly to your inbox every Friday. With a few clicks you can highlight every adverb in your writing (a great tool for catching weak verbs). The Custom Meta-Data section has been moved and improved so that it might actually be useful to those of us who don’t write computer code for a living. The cork-board view has a cool new timeline feature. 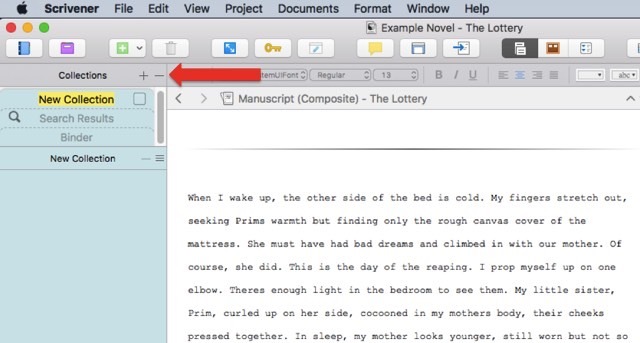 You can open as many as four windows at a time to compare what you’ve written. You can view project history statistics (like how many words you wrote in November 2017). Ohhh… there are fun times ahead. Stay tuned. First a quick explanation of Composition Mode. 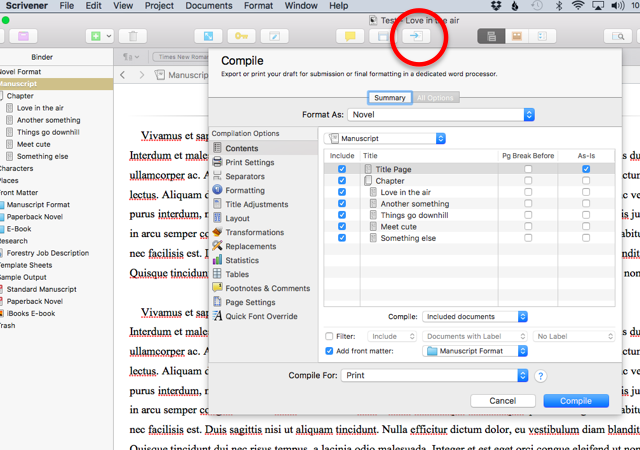 If you click this little icon at the top of your Scrivener window, the rest of your desktop will fade out so that all you see is your project.You can adjust the settings with a pop-up menu at the bottom, and exit Composition Mode by hitting escape. Try it. This is great and all… but what if you need to reference some of your research while you’re writing? 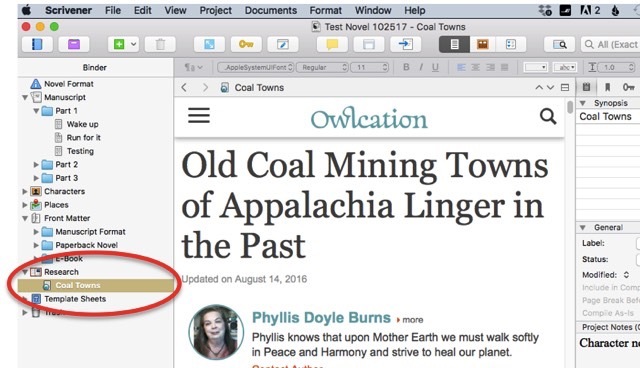 Going back to the post I wrote about embeding a website, imagine you’re writing something set in a coal mining town, and you want to reference this great article you found as you’re writing. 1. Click on the research you want to be able to see while you’re in Composition Mode. For this example, I’m using a website I embeded about coal mining towns. 2. Click on the Quick Reference icon, circled in red here. 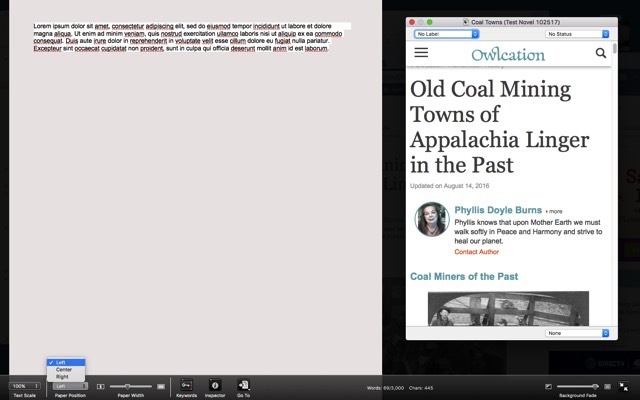 You will see your research (in this case, the website on coal mining towns) in a pop-up window. 4. You can click the icon for Composition Mode and the pop-up window will remain visible, even though the rest of your desktop will fade away. Bam. There you have it. 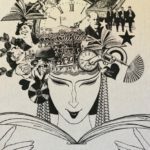 Your writing and your research side by side, without distraction. If it doesn’t look quite like that, you can adjust the view using the pop-up menu at the bottom of the screen so that your page shifts left or right. You can widen or shrink your draft. And you can move the research window around by dragging it. Now that you know this little trick, you can use it with any of your files. You’re not limited to embeded websites by any means. It works just as well with any research files, or character studies, or place descriptions. 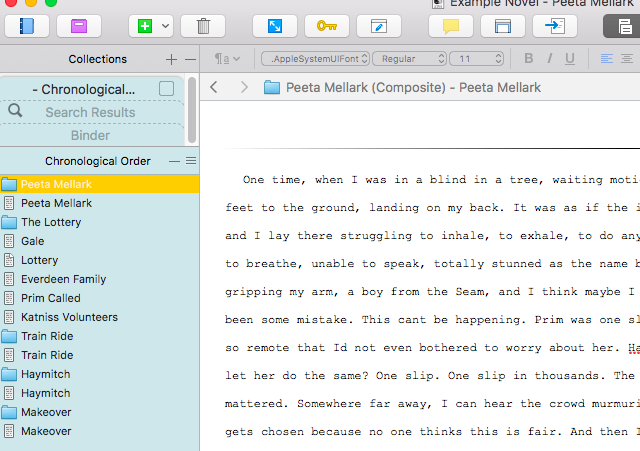 You can can even select a whole part of your manuscript to show in the pop-up window as you write. Play around with it. Have fun. 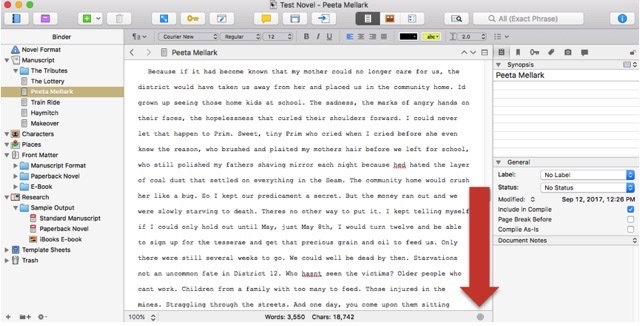 And let me know if you find any other ways this little trick can be used to make our writing more efficient. 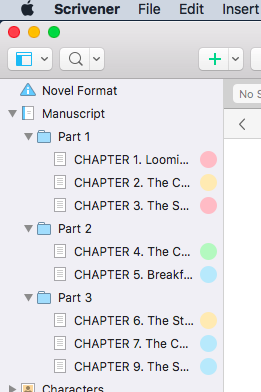 If you’ve been using Scrivener for any period of time, you know that the column on the left, the one with the all the files and folders that make up your story, is called the binder. What you may not know is that there are several layers to the binder. These are called Scrivener Collections and they can be super useful for organizing your work in various ways without messing up your draft. Let’s explore. To reveal your collections, click the little purple file folder at the top left of your window next to the Binder icon. Name your collection by clicking on the highlighted text and typing in whatever you’d like. This is easy to change at any point so don’t stress. As the name Scrivener Collections would imply, these folders allow you to collect pieces of your project in one place and play with them a little, without messing up your project. One example is rearranging the timeline of a story. My second novel (still in early draft stages) jumps around in time. In my binder I have it organized as I intend it to be read. A chapter from the 1700s, followed by a bit from the 1900s, then a chapter set in the 1800s. Frankly it’s kind of a mess right now. I’m not even sure it’s going to work. But that’s how I like it (for now). But sometimes it is helpful to see it arranged chronologically. I created a collection called “Chronological Order” to experiment with. To fill that collection, I click back to the binder and highlight the content I want to move to the collection. Then I click the little wheel icon at the bottom of the binder. Notice that, in the collection, the left column is blue. This is to alert you to the fact that you are not in your binder anymore, but are instead working in a collection. You can change the color by clicking on the little box next to the name of your collection at the top there. You can move things around as much as you want in your collection and NOT CHANGE the order they appear in your binder. Any changes you make to the actual content WILL CHANGE what is in your binder. So if you’re reading along in your collection and correct a typo, it will be also be corrected in the binder. As I mentioned, I like to use this to read my story through in chronological order. I’ve also heard people say they use it to pull one character’s story apart from the main narrative. If you have a novel that has two perspectives, you could have it all laid out in the binder, then have a collection where you separate out each character’s POV to check the consistency of their narrative. You could use it to track themes. Or maybe there’s an object in your story that changes hands a lot. You could pull out the scenes with just that object and track how it moves without the distraction of scenes that don’t address the object. Like most things in Scrivener, you can experiment without fear of breaking anything. So have fun, play around. And let me know how it works for you. 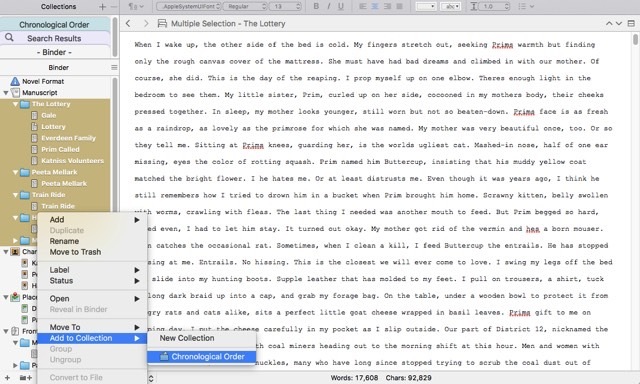 I’m always curious to hear how different people use the various functions in Scrivener. 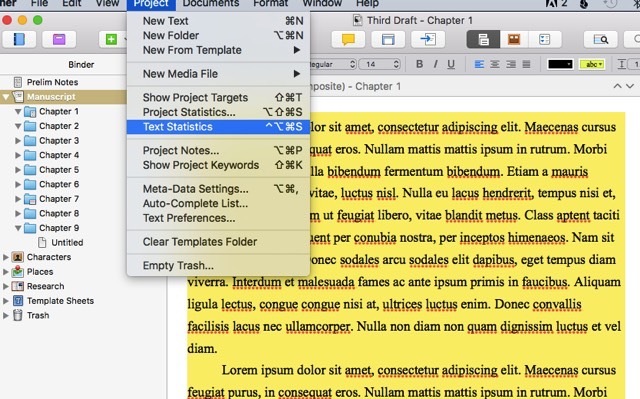 In Scrivener, there are two ways that I know of to keep track of how many words you’ve written on a project. The first way to track your progress is the Session Word Counter, or as I like to call it – the daily word counter. I wrote a post about that one last year. The Session Word Counter is great when you’re trying to track how much you’ve written overall in a day, and track progress toward a certain goal, like 50,000 words in a month (ahem, NaNoWriMo). The super cool part about this function is that if you skip a day it automatically recalculates so you know how many words you have write on your remaining days to hit your goal. It also allows you to schedule days off. This is one of my favorite Scrivener functions. Check it out. 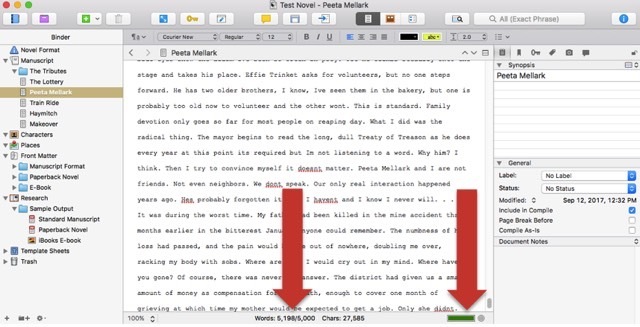 I’ve only just become aware that there is another way to track your word count in Scrivener. It’s much more specific, and independent of a time frame. It’s called the Document Word Count. You’ve probably seen the little icon for it at the bottom of the page there. This is where you enter your target word count for THIS PARTICULAR section of your project. See the band at the left of the image? the one the color of mushroom soup? That is the section for which I am setting my goal of 5,000 words. It won’t apply to anything else in the project and it has no timeframe associated with it. Once you enter your word count goal and click ok, that information at the bottom of the screen will change. Notice that now, instead of just a word count at the bottom of the screen, you have a readout of where you are in relationship to your word count goal. Here it’s 3,550 words out of 5,000. If you’re working on a particular section and could use a little motivation, this little colored bar can be a fun way to see your progress. 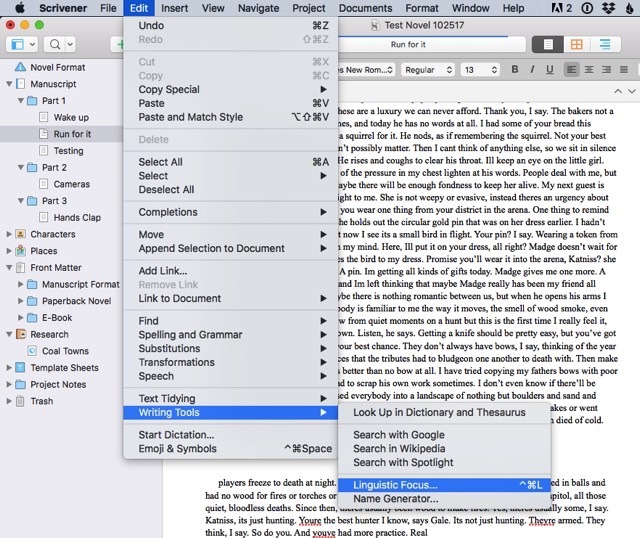 Check out the links below for more Scrivener tricks. One of the things I like about Scrivener is that it exports my work in a format that makes me look super professional, but allows me to work in any font, in any size, like it’s our little secret. Here’s how it works. There are two ways to adjust what your project looks like while you’re working on it. Create a preset format. This is a little more involved, and I’m not sure I understand the benefit gained by the extra steps, but if you’re curious, check out this video. It’s quite long, but starting at minute 2:30, they go into detail about preset formats. They even walk through the steps on both Mac and PC. 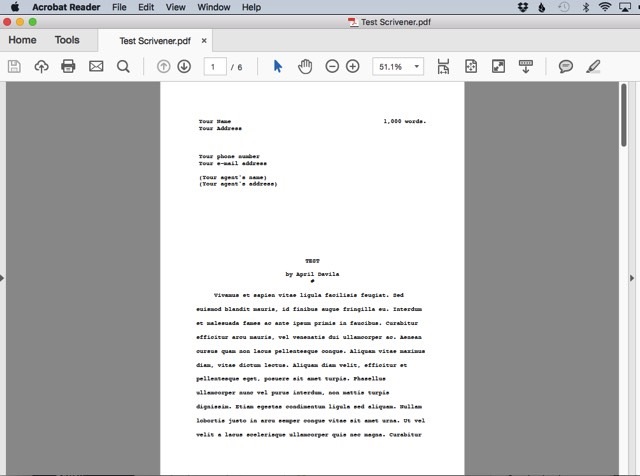 The great thing is that, no matter what settings you use for your manuscript while you’re working on it, Scrivener will export your work according to industry standards. So you can work in 20 point Andale Mono if you want. Heck, make all your words green if you want. Do whatever works best for you. It’s your work. When you’re ready to export your work, simply click on the little icon at the top that looks like a page with an arrow on it. And that’s that. 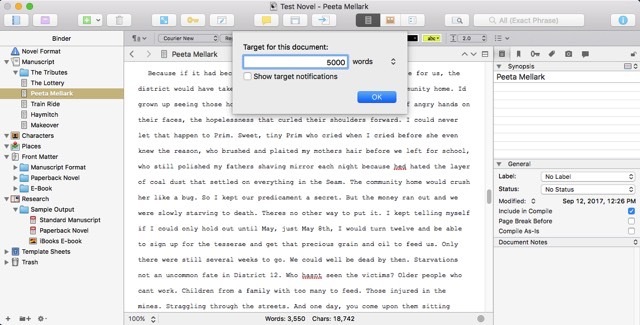 A quick easy trick for making Scrivener work for you. Now go get writing already. 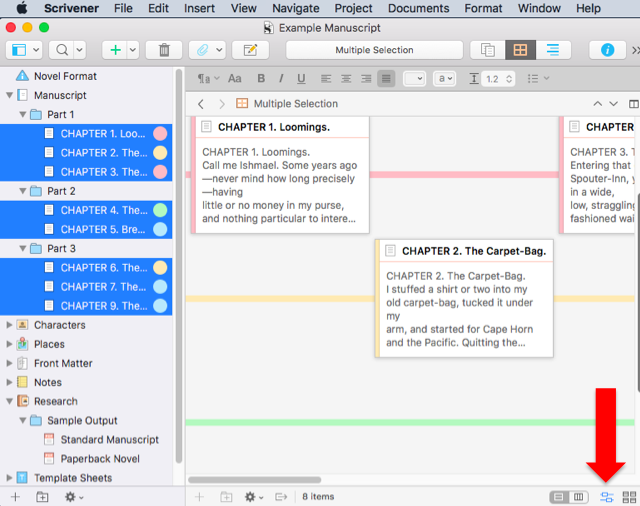 It took me a while to understand the value of the Scrivener corkboard. 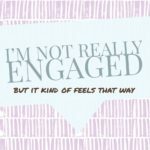 It was frustrating at first, because I’m a visual person, and I love using note cards in real life, but I just couldn’t get comfortable with the digital version. That was before I learned three little tricks that made the corkboard work for me. To get started, you’ll need to know how to get into the corkboard viewer. 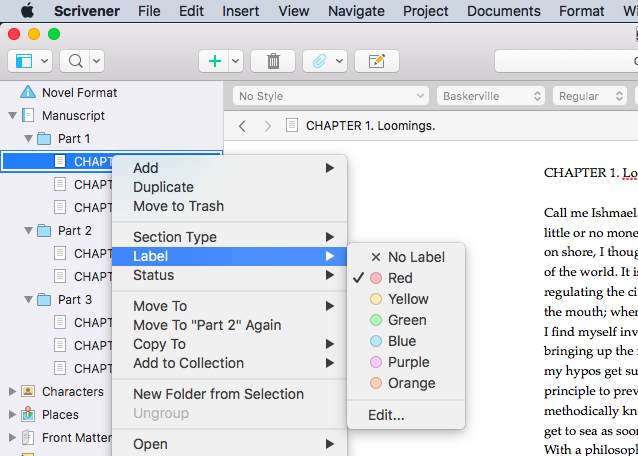 In Scrivener, you have three options for how to view any given project. You can toggle between the options by clicking here. The middle option will give you the corkboard viewer. 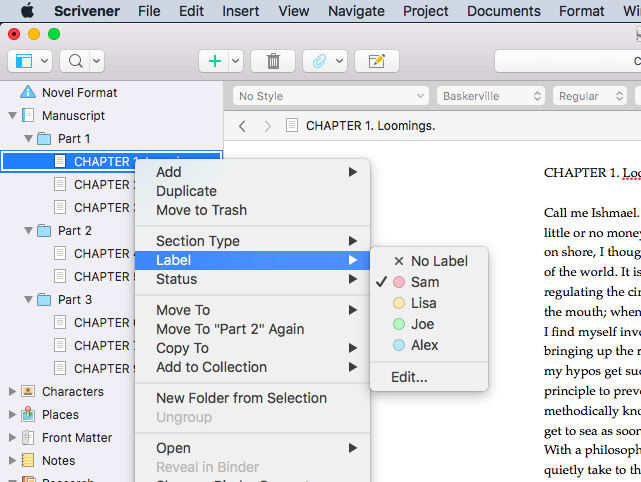 Trick #1: Scrivener can fill in the synopsis of each scene for you. When you switch to view the corkboard, you’ll see a card for each scene, along with the title of each scene, but you won’t see any of the scene’s content. 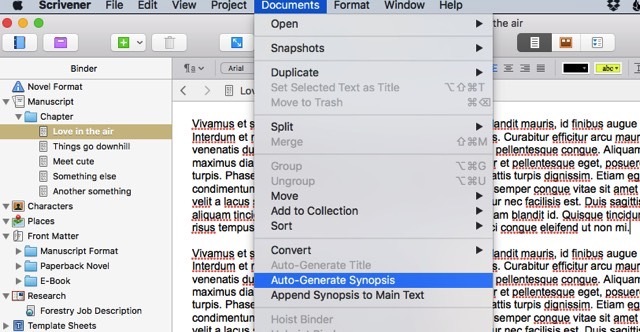 So you can either write a short synopsis on your own, or you can have Scrivener do it for you (yes, please). Just click on the scene in the binder (the column on the left), go to Menu -> Documents -> Auto-generate Synopsis. In truth, it’s less of a synopsis, and more a duplicate of the first paragraph of the scene, but for me it’s enough. Trick #2: You can do every scene in one shot. You can transform a corkboard of blank cards to a very basic summary of your story by first highlighting every scene (by holding down the shift key and clicking), and then executing the steps in trick #1. Boom. A Synopsis for every scene in about 3 seconds. For me, this was the thing that really made the corkboard useful. 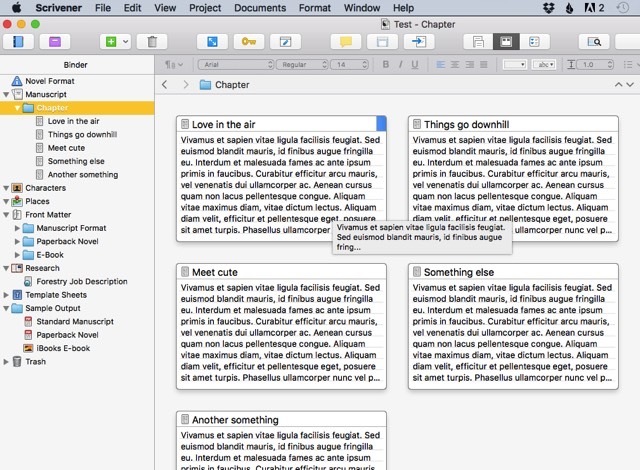 Down there at the bottom of the Scrivener window, you’ll see options for formatting how your cards display. By playing with your options here, you can really start to customize the corkboard in a way that works for you. And if you’re on a Mac, you can click that center option and really have some fun. This little button allows you to move cards around in free-form, and for me, this is the moment when Scrivener beats out my paper notecards, because not only can I move things around in a highly organic way, but I can save them, so there’s no risk of the dog messing up my precious work when I step away for half a second. Of course, you can always reorganize the binder by simply dragging and dropping chapters up and down the columns on the left, but for those of us who like to be able to spread things out in front of us, the corkboard function can be really useful. 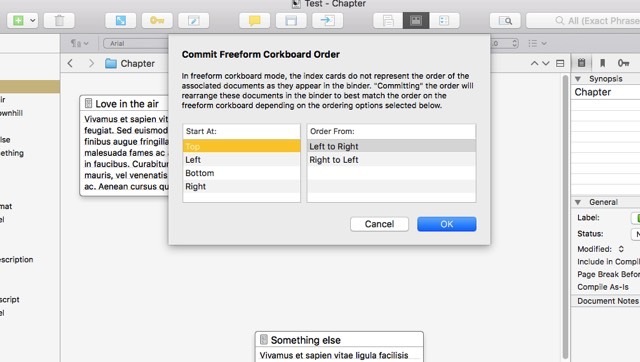 Do you use the corkboard format for your writing in Scrivener? Do you have any little tricks that you love? I can get a little analytical with my writing. It’s the tech nerd in me. So you can imagine my excitement when I found an online word frequency analyzer a few years back. I loved being able to break my story into data and look for interesting trends. The only bummer was that I had to cut and paste my entire story into a text box on a website. Call me paranoid, but I just don’t like the idea of inserting my unfinished work into the Internet. 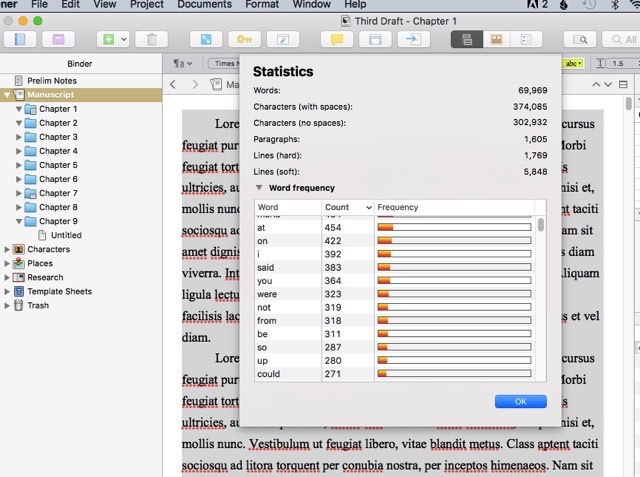 And now I don’t have to, because I just discovered the Scrivener word frequency analyzer. Oh, joy of nerdy joys. 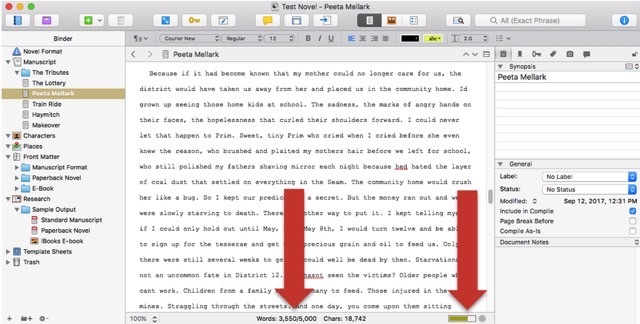 If you’re on a Mac, simply highlight the text you want to analyze. (Yes, I’m using some fake Latin text. Like I said, I hate putting my unfinished writing out on the web.) Then go to Project ->Text Statistics. You may need to click the triangle in front of “Word Frequency” to unfold the data. 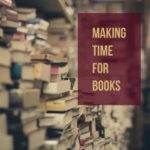 Click on the column heading where it says “count” to sort words by frequency. Personally I like high to low. At the top you will see words like “to” and “a.” There’s not much insight there, but scroll down a bit and things get a little more interesting. The draft I analyzed here is about 250 pages long (and yes, most of it is English). According to the analyzer, I used the word “were” more than once a page. There’s definitely room for improvement there. I also used the word “could” an awful lot. To me, this is a red flag that I’m still figuring things out on the page. I tend to use “could” when I’m not sure what my characters are doing. So in my editing, I can use the Find function to locate all those instances of “could” and see if maybe I need to dig a little deeper on my character development. Then I scroll through looking for weak verbs. The word “see” jumps out with a frequency of 98. Again, in a draft of about 250 pages, that’s a lot of seeing. I bet I could find a better word to describe what my characters are doing for most of those. Maybe they’re peering, or spying, or understanding instead of just seeing. I used the word “very” 51 times. Ug. That’s 51 instances of needing a better word. Guaranteed. It’s easy to get caught up in this kind of thing, so tread lightly. While the data can be illuminating, you don’t need to address every word, wondering about the meaning of its frequency in your story. Simply scroll through looking for anything odd. If you have about 300 pages in your story, scroll to see what words come up about 300 times. Are they words that really should appear on pretty much every page? If not, you’ve got some work to do. Have you used the word frequency counter? Did you find anything that surprised you?